We started by pulling the entire interior out of the car. Most of the dashboard was disassembled for cleaning. We're backdating the car to 1993 specs, so while things were apart we removed the air bags in favor of the 1993 components. The swap saved us some weight and is legal under SCCA’s Street Prepared rules. Once things were clean in there, we installed some quality used carpet. 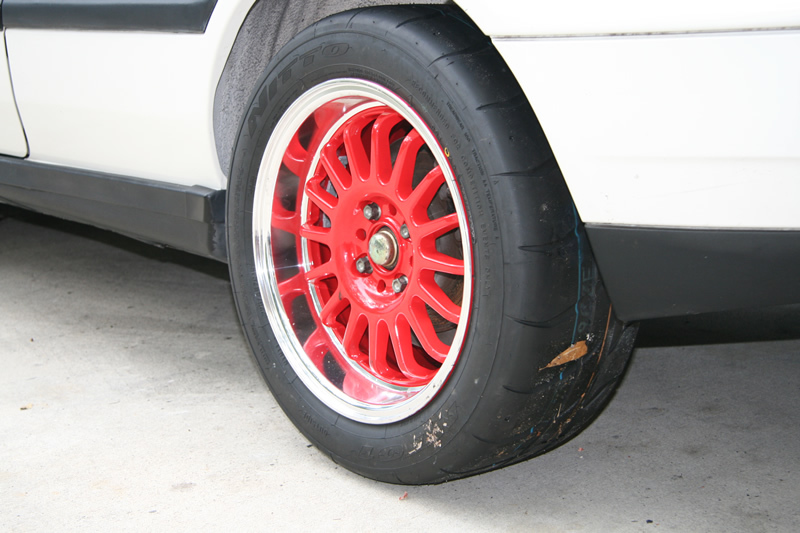 The Konig Retrack wheel is very attractive—and noticeable thanks to the red center finish and fat lip. We really need to work on the car's suspension next. Our 1995 Golf is slowly becoming presentable. This past weekend, we finished up the bulk of the interior cleaning by completely disassembling the cabin and replacing the carpet. 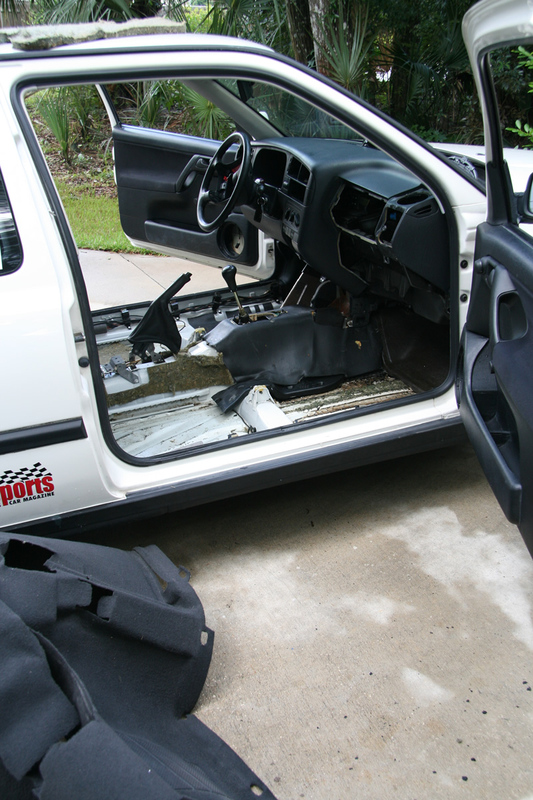 We took apart most of the dashboard as well as the seats, door and quarter panels. After about five hours of cleaning, we installed some good used carpet from VWParts4Sale.com. Our worn-out and out-of-round tires were replaced with some new rolling stock. We chose Konig’s new 15x7.5-inch Retrack wheel and Nitto’s 225/45R15 NT01 tire for track duty. (We’ll also be ordering a set of 16x7-inch Retracks with some 205/40R16 Nitto NeoGen tires for street use.) 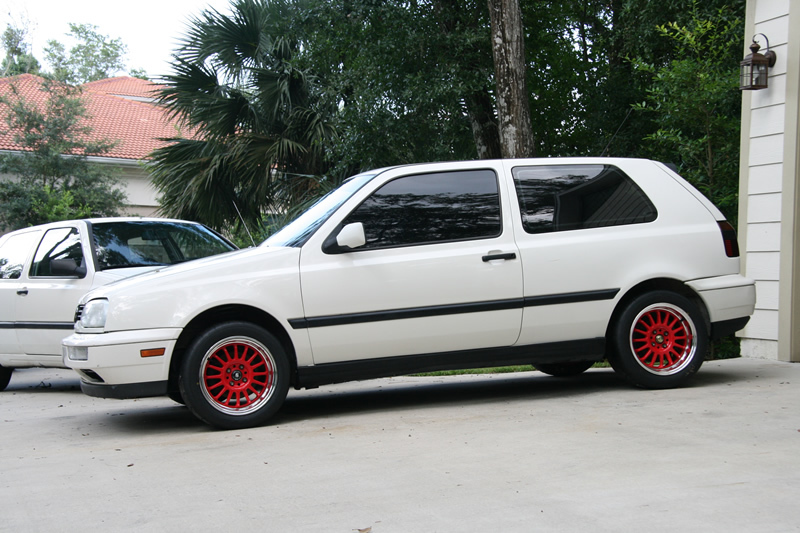 The red finish and fat lip look great on our Golf—and will look even better when we replace the entire suspension and lower the car a touch. The Nittos and Konig wheels were sourced from Discount Tire Direct. Their prices were good, and they shipped the wheel and tire package quickly. Want to cut out shipping costs? You can also purchase tires and wheels through one of the company’s regional dealers. Next up, we’ll be tackling some much-needed maintenance and diving into our suspension work.